That classic sophistication. Those red lips. That trademark bun. Those gorgeous high cheekbones. These words more than aptly describe the one and only Audrey Hepburn. Born May 4 in Belgium to an English banker and a Dutch baroness, Hepburn has become an icon around the world for her incomparable elegance. Who among us has not wanted to stand in front of Tiffany's wearing oversized sunglasses and an LBD looking absolutely and utterly perfect? Fringed bangs, doe eyes, red lips. 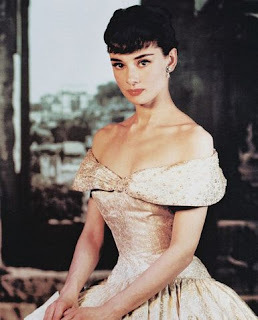 The graceful actress appeared in more than 30 films throughout her life. Her appealing demeanor and utter loveliness cast spells each and every time the camera fell on her. 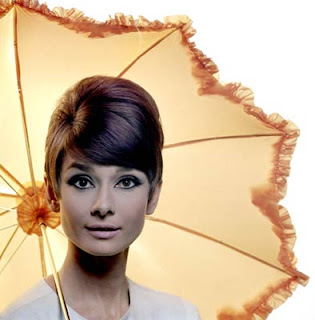 In addition to the smash hit Breakfast at Tiffany's, Hepburn played lead roles in such films as Sabrina, Love in the Afternoon, Charade, My Fair Lady, Wait Until Dark and Roman Holiday, for which she won an Oscar. With leading man Cary Grant. And of course the many men in Hepburn's life must be addressed. While she was only married twice -- to the actor Mel Ferrer and the psychiatrist Andrea Dotti -- she was lucky to work with most of the leading men in Hollywood. Cary Grant, Rex Harrison, Gregory Peck and Humphrey Bogart among them. 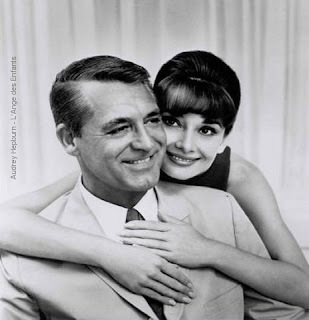 Of her leading men, Hepburn said, "Actually, you have to be a bit in love with your leading man and vice versa. If you're going to portray love, you have to feel it. You can't do it any other way. But you don't carry it beyond the set." Almost looking like Twiggy here -- but pre-Twiggy, of course. 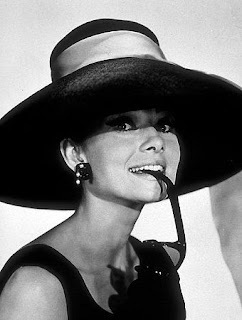 Hepburn's iconic look from Breakfast at Tiffany's. 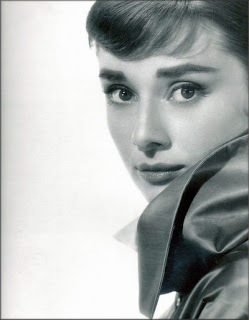 But Hepburn was so much more than an actress. Her work with UNICEF, for whom she was the Goodwill Ambassador throughout the 1980s and early 1990s, earned her respect worldwide for being a true humanitarian. She worked in some of the most disadvantaged communities in Asia, Africa and South America, often putting herself at great personal risk. No matter what the situation, Hepburn always looked flawless. Her porcelain skin was always clear and glowing, with a somewhat matte finish that lent her a sophisticated look. 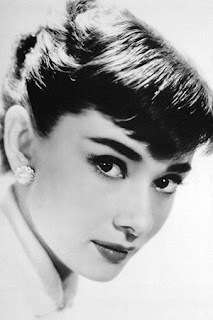 Rarely wearing much eye makeup -- though at times playing up her doe eyes with loads of black mascara -- Hepburn opted instead to focus on playing up her full lips with deep red lipstick. 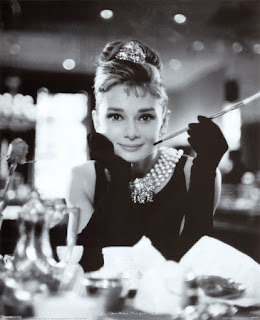 As Holly Golightly in Breakfast at Tiffany's. I'd venture a guess that this is among one of the most recognized character photos in the world. 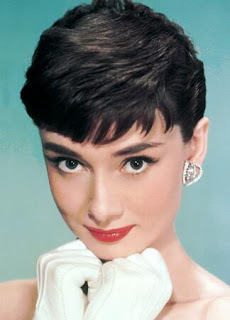 Sadly, Hepburn succumbed in 1993 to abdominal cancer. The exemplification of a Beautiful Belle, she will always be remembered for her graceful approach to life and her true elegant beauty. 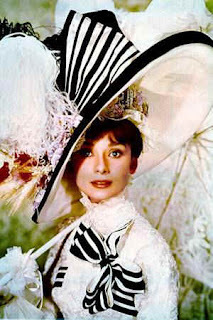 As Eliza Dolittle in My Fair Lady. What a nice article, Jamie! Thanks for this! Loved this article! 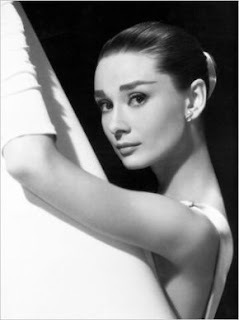 Audrey Hepburn is one of my favourite classic beauties! 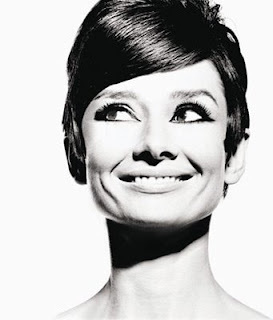 Because really, who doesn't love Audrey Hepburn? A great example of beauty that doesn't rely on too much makeup or tanning beds! Oh, I LOVE her! Simply beautiful, and completely classy. Hollywood doesn't have that kind of style and grace anymore. This article rocks! For my AP US History class, we have to dress/act/present an influencial person from the 1950s. My room is decorated in Audrey Hepburn, Marilyn Monroe, and James Dean. 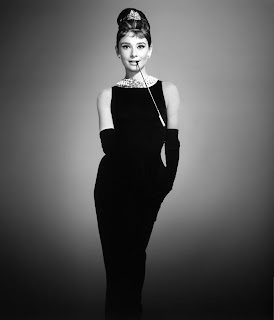 Of course I had to choose Audrey! I absolutely love her, and this helped me out a lot.